A unique opportunity is now available in the highly sought after Galley Beach neighborhood, in close proximity to the Cliffside Beach Club, Steps Beach and Town. 38 Jefferson is now being offered with 40 Jefferson, the adjacent oversized lot, creating an unprecedented compound on ½ an acre. This additional oversized lot offers 3000 sq. ft. of available ground cover and included in the sale are HDC approved plans for a 5 bedroom, 5 bath and 2 half bath main house, leaving plenty of room to accommodate a cottage/cabana, pool and garage. A buyer may also choose to develop the parcel to compliment 38 Jeffersonâs grand design or hold as a blue chip investment. 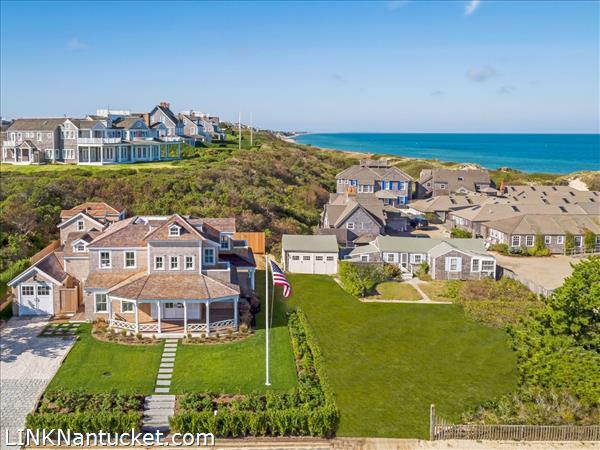 The developer collaborated with Nantuckets premier architect, Emeritus Development, and designer, Elisa H. Allen Design, to create this legacy property that takes advantage of the sweeping ocean views over Galley Beach and Nantucket Harbor. Enjoy the breathtaking first floor views of ferries and yachts entering the harbor as the Galley beach umbrellas gently blow in the breeze. The historic main house has been re-sited on a new foundation and is completely renovated from top to bottom creating a stunning 5 bedroom, 5 1/2 bath home on 3 levels. The addition of a new 1 bedroom, Guest Cottage/ Pool Cabana compliments the gorgeous, private outdoor entertaining area that includes a heated Gunite swimming pool surrounded by mahogany decking. This estate is offered furnished, turn key and available for immediate occupancy for family and friends to enjoy this summer. Please send me more available listings similar to 38 & 40 Jefferson Avenue, Cliff. Thank you!